Netflix loves to suggest movies with "strong female leads" to me. Not that I have a problem with strong female leads, but I can't help but wonder why this is a category yet movies with "strong male leads" is not and what movies would be categorized as "weak female leads". I probably over think my Netflix choices. That said, for this week's yarn along, I have a finished project and a book, both based on strong, complex female characters. I finally finished my version of Tanya the Sampler Girl's Jane Eyre shawl which was a mystery KAL in her ravelry group last month. I knew I wouldn't make the deadline because I am a slow knitter and I like big shawls. 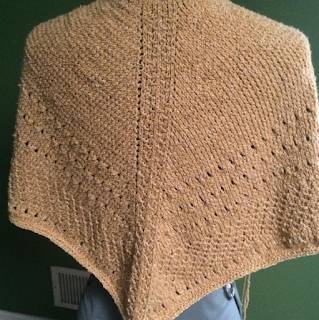 I knit this in Berroco Remix after seeing one that Tanya did in the same fiber. I modified the pattern by adding 7 more repeats of clue 3 and another repeat of clue two. While this picture was taken before blocking, I think this is a nice size summer shawl for cool nights at the shore and the frigid air conditioning favored by Southern states! Late last week I picked up a copy of My Name is Lucy Barton by Elizabeth Strout from the library. Tanya did not like this book and shared her opinion on her latest podcast, and I've heard mixed reviews from other people, but it's a short book so I thought I'd check it out for myself. Written by the author of Olive Kitteridge, this book has less about detail and more about things not said. Lucy Barton recounts her experience in a New York City hospital during the 1980s when she's still married to her first husband and her children are little. She goes in to the hospital for a routine apendectomy but remains there for 9 weeks suffering from a mysterious fever. Lucy's mother visits her in her hospital room that overlooks the Chrysler building, and the attempt by these two women to reconnect takes up the bulk of this slim novel. In many ways, the silence of this book is more powerful than what Lucy recounts in its pages. She shares flashes of extreme poverty and abuse but because she can't face it, the reader experiences not what actually happened to Lucy but instead her scattered memories and fierce denial. The ultimate inability of mother and daughter to talk about what happened in their lives and express how they feel is heartbreaking and yet so real for these two women who find it impossible to say "I love you" out loud. This is definitely not a book for every taste but if you have read Lucy Barton, did you love it or not? Let me know by completing the poll in the sidebar! I loved it too. Your review of it is spot on! Your shawl also looks beautiful. I’m a high school teacher who knits, reads, cross stitches, sews, and (most of the time) completes bible studies.